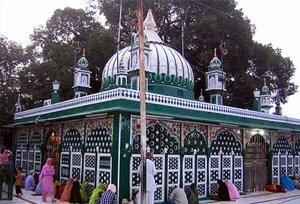 Piran Kaliyar Sharif Dargah in Haridwar - History, Best Time to Visit, How to Reach? Located in the south of Haridwar, Piran Kaliyar is claimed to have a mystical power that fulfills all the wishes of devotees who visit here. Piran Kaliyar is the dargah (shrine built over the grave of a revered religious figure) of the 13th-century saint of the Chishti order, Alauddin Ali Ahmed Sabir Kalyari, who was also the successor to Baba Farid (1188–1280), and the first in the Sabiriya branch of Chishti Order. The dargah was built by Ibrahim Lodhi, an Afghan ruler of Delhi. Alauddin Sabir Kaliyari, the revered saint, was born in Kohtwaal, a town in the district of Multan. His mother was Jamila Khatun, who was also the elder sister of Baba Fareed. After his father's death, Syed Abul Rahim, his mother brought him to Pakpattan in the custody of Baba Fareed. Alauddin was made the in-charge of langar (common kitchen/canteen) by Baba Fareed. After an extended period, Jamila Khatun came to see his son, Alauddin Sabir Kaliyari and found him weak and lean. Jamila Khatun, in her full anger, went to Baba Fareed to seek explanation and then he said that the day since he (Alauddin) is made him the in-charge of the kitchen, there is no shortage of food. When asked Alauddin about this he said, " True, I was made in charge of the kitchen, but I was never told I can eat from it." When asked about his survival, he said that he went to the jungle in free time and ate whatever he found. After this incident, he was given the title of Sabir. Further, he was asked to visit Kaliyar Sharif in 1253 AD, where he stayed until his death in 13th Rabi al-awwal 690 Hijri (1291). Due to its proximity to the revered shrine, Haridwar, the dargah is highly revered by Hindus and Muslims. Through the centuries, a small town developed around the shrines, and it was christened as Piran Kaliyar. Dargah is a sight to behold during the Urs festival; the death of Sufi saint is celebrated with great pomp and show. By Roadways: Roorkee is approachable from the different parts of North India. From the Roorkee bus stand, rickshaw, buses and taxis are easily available to reach the dargah. By Railways: Roorkee Railway Station, 10 km from dargah, is the closest railway station. From the station, car and taxis are easily available to reach the dargah. By Airways: Jolly Grant Airport, 61 km from the dargah, is the nearest airport.